Typically, a beach house rental will have almost everything you need for a great vacation, from a hot tub to a boogie board. What about the stuff in the fridge and the pantry? There’s usually nothing in them. For that matter, one has to visit the nearby market and stock up before hitting the shore. Another solution is to take the ingredients provided by your food delivery service with you to the resort. We’ve decided to help you out with our five easy vacation meals, all of which use just 20 ingredients and allow a hassle-free meal preparation. Read on! Combine garlic with the next 7 ingredients and chop them in a food processor. Transfer the mixture to a bowl and then process some tomatoes until you get a smoothie. 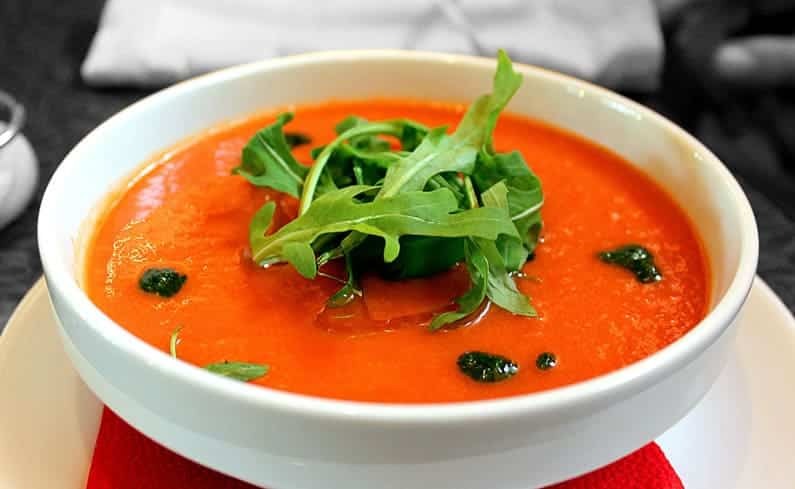 Stir the tomatoes into the vegetable mixture and cool it until it’s ready to be served. Toss the shrimp into the olive oil, and then sprinkle it with pepper and salt. Grill it over medium heat up to 5 minutes. Pour the soup into the bowls, and top it with the shrimp. It takes only half an hour to create this meal, giving you more time to spend on the beach. 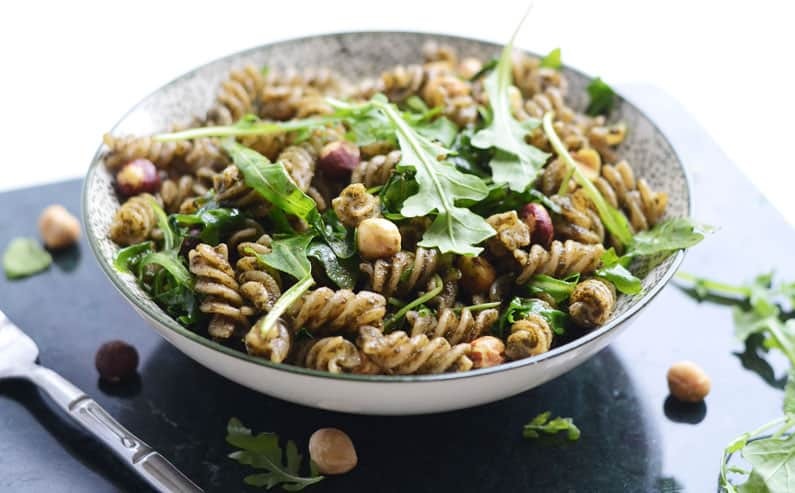 The full name of this recipe is Pasta with Arugula Pesto, and the fact that it can be made so quickly makes it a perfect choice for the vacation weeknights. Mix the first three ingredients with 1 sliced garlic clove in your blender. Once they’re coarsely chopped, add 2 tablespoons of olive oil and lemon juice, and pulse the mixture once again until you get a paste. Season it with some black pepper and kosher salt and set it aside. Once you’ve prepared the pasta (according to the directions on the packaging) heat the remaining olive oil over medium heat. Add 2 garlic cloves to it and cook it for one minute. After that, add the tomatoes and cook it for another 5 minutes. Toss arugula pesto with the hot pasta, top it with some mozzarella and serve it with tomatoes. Place bread in your blender and pulse it until the formation of fine crumbs. Stir in the cheese, 1/2 tablespoon black pepper, and 1/2 tablespoon kosher salt, and then transfer the whole mixture into a bowl. Then, whisk the eggs together with 1 tablespoon of water into a second bowl. Combine 1/4 cup olive oil, garlic, tomatoes, and lemon juice in the blender, and then season the mixture with vinaigrette, pepper, and salt. Set it aside. Slice the chicken breasts, dip them into eggs, and dredge them in your breadcrumb mixture. Take a skillet, add 2 tablespoons of oil and put it over medium heat, and then add the chicken breasts. Cook them until they’re golden-brown. Toss the cucumber and arugula with reserved vinaigrette in a bowl and serve immediately. Home Chef offers a very similar recipe – Lemon Parmesan Chicken Orzo. Take it into consideration if you’re subscribed to this service. Check out home chef review here, and see what else this company has to offer. ​As the name suggests, this is an Italian recipe – a tasty summer salad made of tomatoes and crispy bread. The addition of eggs and prosciutto turn it into a perfect post-swim meal! Preheat your oven to 350 degrees. Put the eggs in a saucepan, cover them with cold water, and heat over medium heat until boiling. Remove the pan from heat and set it aside for 10 minutes. Run the eggs under a stream of cold water until you can handle them and then peel and chop them, and set them aside. Meanwhile, arrange your prosciutto slices onto an aluminum foil and arrange your bread chunks on another baking sheet. Bake both for around 10 minutes. When it’s cold enough for handling, break the prosciutto into pieces. Whisk together garlic, lemon juice, and olive oil into a bowl. Season the mixture with black pepper and salt. Toss eggs, bread, and lettuce into a bowl add the dressing, top with parmesan and prosciutto. 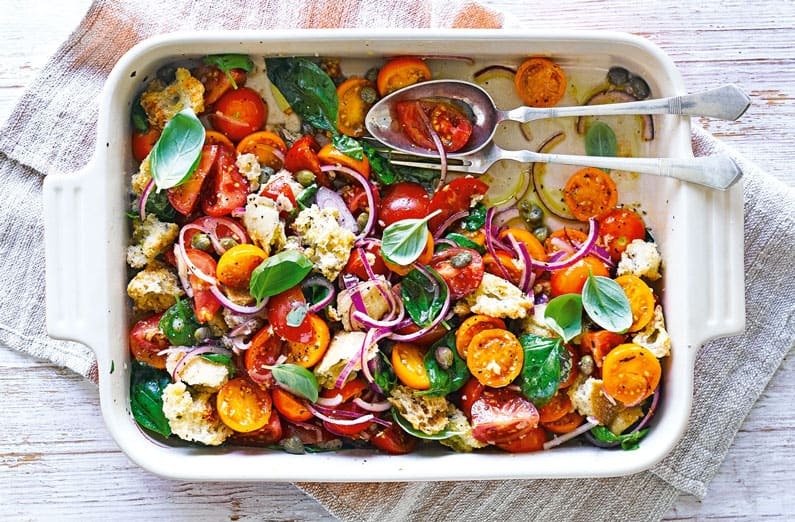 That’s it – your Panzanella is ready for eating! Chicken and Nectarine Panzanella by Freshly is a delicious variant of this recipe – it’s as equally quick to make and tastes great. Preheat grill to medium heat. Combine 1/4 teaspoon of black pepper and salt (each), 2 tablespoons olive oil, and 1 tablespoon lemon juice in a bowl. Add chicken, tossing to coat, and let it marinate for around 10 minutes. Grill the bread until it is toasted and set it aside. Brush romaine halves with 1 tablespoon of olive oil and then grill them until the grill marks appear. Set them aside. Grill the peppers until they’re tender, and then cut them into strips. Grill the chicken breasts for about 8 minutes (don’t forget to turn them every now and then). 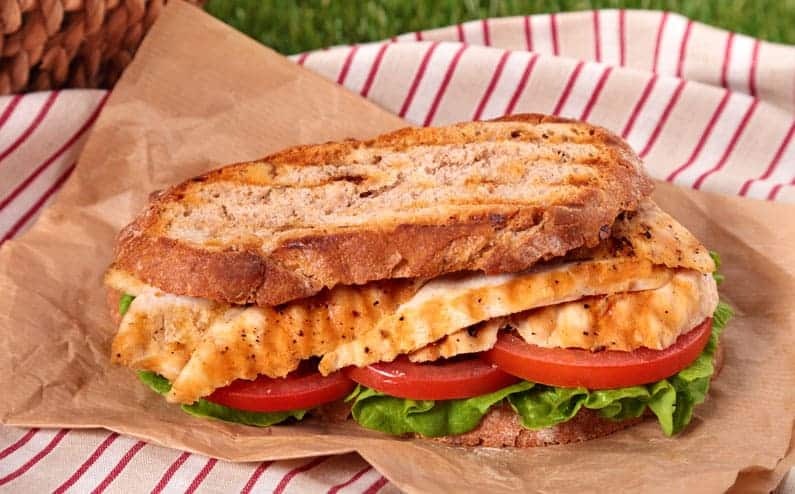 Divide grilled chicken and peppers among the bread slices and top them with some mozzarella. Drizzle romaine halves with lemon juice and olive oil, and then sprinkle them with black pepper, kosher salt, and pine nuts. 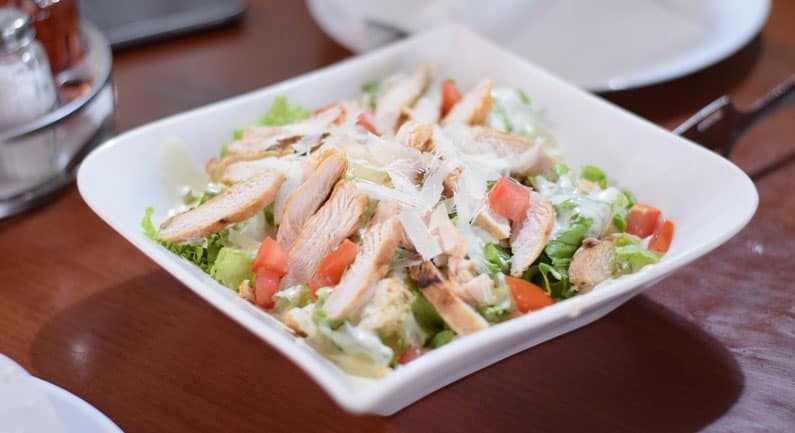 With these recipes, you will be able to spice up your vacation with great food and enjoy tasty meals in the breaks between swimming and sunbathing. Don’t forget to stock up on some snacks and treats, too!